In English the term epiphany indicates the manifestation of a supernatural or divine reality, a sudden intuitive leap of understanding, especially through a visible ordinary yet striking occurrence. The term comes from the Greek epiphaneia, which means “manifestation” or “appearance”. In the Anglican, Eastern, and Roman Catholic Churches the Epiphany is also a traditional feast held on 6 January, celebrating the divine manifestation of Jesus Christ to the three Magician-Astrologer-Shaman Kings, who brought the gifts of gold, frankincense and myrrh. In the United Kingdom the monarch still commemorates the day by offering gold, frankincense and myrrh at the altar in the Chapel Royal at St James's Palace in London. 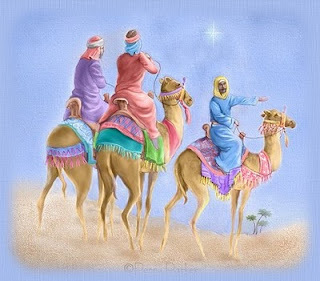 The Epiphany exemplifies the alignment of the Three Magi, representing the height of human wisdom, spirituality and power, with our higher multidimensional nature, as represented by the Christ. The Epiphany occurs 12 days after Christmas, following the Twelfth Night (the eve of Epiphany), exemplifying the complete retrieval of the 12 strategic pieces of the soul, the signs of the zodiac, and their alignment with multidimensional self. Besides the adoration of the three Kings, the Epiphany also commemorates two additional events: the Baptism of Christ and the wedding in Cana, at which Jesus manifested his first miracle, the transformation of water into wine. All these episodes are related with the initiation into the multidimensional power of manifestation and are associated with similar events described in other traditions. Epiphany is also an esoteric Gnostic ritual of the feminine. It is documented that the Gnostics celebrated it in the sanctuary of Kore, the Maiden goddess, who they equated to the Holy Virgin. They said that on the day of the Epiphany the feminine consciousness of the Virgin gave birth to the messianic power of the Christ. The Epiphany was once the original date of birth of the Christ and is still celebrated as such by the Eastern Christian Church. This second birth of the Christ esoterically relates with his multidimensional body and is associated with the Baptism, which is the exemplification of multidimensional birth, as opposed to physical birth. The Epiphany is a festival of most ancient origin and is meant to indicate the alignment between physical third-dimensional and multidimensional reality. It is connected with the first stage of intention, the phase when we stretch into the multidimensional realm, connecting with tour higher self and catching a glimpse of our true nature with all its potentials fully accomplished. It is the experience of the apex of power, which is then either grounded in our life or vanished as a passing dream. The first stage of the intention is an epiphany, an ecstatic experience with potential effects in our physical human and ordinary reality. Ordinary reality is a separated hallucinatory reality, based on the denial of other dimensions. Although it operates to strictly preserve the separation, its illusory structure has gaps which cannot totally prevent the multidimensional from manifesting, at least from time to time. These manifestations have only provisional tangible effects, since when consensus reality becomes aware of multidimensional interferences, it immediately annihilates them, amputating their perception from human awareness and memory. The first stage of intention setting involves acknowledging the epiphany related to an intention and preserving its power despite the censorships of ordinary reality. The epiphany of the intent may be the result of a great inspiration and insight over your potential and something that you deeply wish. It may be the development of a vision achieved during a shamanic journey, a trance experience, a dream or an ecstatic state of consciousness. It can also emerge from an event occurred in everyday reality, when you see in other people or situations a perfect model of what you are, or you may experience it directly in your ordinary life, becoming aware of an unknown potential, as you express it, and receiving unexpected recognition from others. Whatever the case during an epiphany there is a strong inner resonance so that you say or feel something like: “Yes! This is my intent! This is what I am! This is what I want to be!” In the first stage of the intention there is a strong sense of power and feeling supported. It is an epiphany, the experiential and tangible awareness of a multidimensional reality. The second stage brings about a radical shift in perception for it involves having the epiphany coming to terms with the ordinary reality. The second stage occurs once the honeymoon of the epiphany is over, i.e. when ordinary reality becomes aware of the multidimensional interference and tends to block it. This stage entails confronting a setting where the intention is not manifested yet and I need to get down to work if I do aim at implementing it. The time of the epiphany is apparently over. It belongs to the past, which according to ordinary reality is gone. Hence after the epiphany I may not feel the same resonance, trust and intensity I experienced in the first stage. I may also feel depressed, disillusioned and fearful, believing that the epiphany was merely an illusion. Falling into this pitfall is typical for most folks on the multidimensional path. There is no way I can avoid it unless I understand the basic difference between ordinary and non-ordinary, third-dimensional reality and multidimensional realms. Our ordinary reality is a linear setting based on a single frequency of time where beings move in strict conformity with a given speed, which is measured by our ordinary watches. The movement cannot be accelerated or slowed down and only proceeds in one direction with no reverse gear. Ordinary reality is therefore fixed in a time-space line with no possibility of venturing elsewhere. On the other hand whatever is beyond the third dimension contemplates movement through time, which means that I can move into the past or future at will. It follows that if I have an experience of epiphany on 6 January, I can return to that experience also on 17 January and any other possible time, if I decide to do so. The reawakening of our multidimensional nature implies the retrieval of our capacity to live through time, which means becoming aware that the epiphany I once had continues to exist somewhere even if it is not apparently happening in my ordinary perception of time. This capacity is not gained overnight. It involves a gradual stretching of our dormant multidimensional nature and the exercise of our faculties of memory and imagination, which hold the key to the retrieval of our power of epiphany. The brain does not know the difference between what it sees in the ordinary environment and what it remembers from the past or anticipates about the future. It merely processes information contained in neuronets, which are the linking devices of our nerve cells (neurons). All our human thoughts and feelings are built up in neuronets. Ordinary reality controls the basic setting of neuronets determining what is real and not real. The epiphany process aims at bombarding this setting allowing emergence of alternative configurations and free viability through other time-space frequencies. Happy Epiphany! Up with the Three Kings!